Assistance at your arrival to Lima International Airport and transfer to your hotel. There you will receive a briefing on your tour. Day 02: Lima City Tour – Larco Herrera Museum – Ica. Breakfast guided sightseeing tour to the most attractive and important sites in Lima, The tour includes Lima’s Historical Centre, passing by Plaza San Martin, Plaza Mayor the Government Palace, the Cathedral and its Religious Art Museum, the Church of Santo Domingo, with the tombs of Santa Rosa and San Martin de Porras, and Lima’s Colonial Balconies. 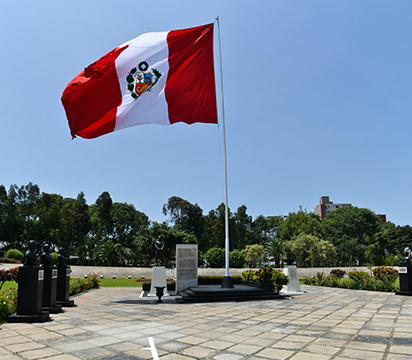 We will visit the Convent and Church of San Francisco and then we will visit Larco Herrera Museum, for an excellent overview of Peru’s ancient past. The museum has many. And finally we will go to the residential Districts of San Isidro and Miraflores, passing by the Huaca Pucllana, a Ceremonial and Administrative Centre of the Lima Culture, We will also visit El Olivar Park with olive trees brought from Spain, the Central Park of Miraflores and Larcomar, a symbol of modern Lima and a tourist and entertainment centre as well as enjoy an amazing view of the Pacific Ocean. Return to your selected hotel in Lima. time to have lunch. Transfer to the bus station where you can take the bus to Ica. Once in Ica Transfer to the selected hotel. Day 03: Ica – Paracas – Ballestas Island – Nazca – Arequipa. Early in the mornig before sunrise we will transfer to Paracas and holds the most important wildlife sanctuary of the Peruvian Coast. Guided boat excursion to the Ballestas Islands, where we can observe Sea lions, Boobies, Pelicans, Penguins and other Marine birds. On way, from the boat, we can also see the “Candelabro”(Candelabrum), a giant figure etched in the sand on the side of a hill in the style of the Nazca Lines. Transfer by bus to the City of Nazca, transfer to the hotel where you can leave your belongings, after that you will be taken to Nazca’s airstrip in order to get onboard a light aircraft that will fly over the mysterious Nazca Lines which can only be appreciated from the air. In the afternoon you will have the chance to rest a little in the hotel. At night we will leave for the City of Arequipa (10 hours approx.) going through deserts and coastal valleys. Day 04: Arequipa – City Tour. Morning city tour of Arequipa, including the Main Square, and the Cathedral, housing beautiful treasures in gold and silver We also visit the La Compañia Church, an ancient Jesuit temple, maybe the most important one in Arequipa then, we will visit the Santa Catalina Convent, a “small town” built in the XVIIth Century and opened to the public in 1970, after 400 years as a Cloister. Perfectly preserved for four centuries, you go back in time as you enter the Cloister and see the numerous, spacious patios and gardens, the kitchen and slave quarters and stone washtubs of this Convent. About 20 nuns, of what were once 500, still live in a section of the Convent. Transfer to your selected hotel and free time for lunch. Evening free. We suggest to dinner at the hotel and have an early night as the next day you will have an early rise to begin your trip towards the Colca Canyon. Day 05: Arequipa – Colca Canyon. Early in the morning, depart on a wonderful four hours bus trip to the Colca Canyon, one of the deepest Canyons in the World (3180 mts.). On the trip we drive across Aguada Blanca National Reserve, inhabited by herds of vicuñas and alpacas (South American cameloids). The highest point of the road is at 4350 m.a.s.l… We also see beautiful pre-Columbian terraces, still being cultivated by native Collaguas, box lunch. On your arrival at Colca Valley, transfer to the selected lodge. Day 06: Colca – Condor Cross – Arequipa. Day 07: Arequipa – Countryside. Breakfast, Then we will leave towards Arequipa’s beautiful countryside, including the Mill of Sabandia, a still functioning flourmill built in 1621 powered by a nearby waterfall and finally passed on to the Goyeneche family. You will also visit its beautiful fully restored church. Day 08: Arequipa – Cusco – City Tour. Transfer to the Airport to board your departure flight to Cuzco. Upon arrival, transfer to your hotel. The rest of the morning free to rest in your hotel to acclimate altitude sickness. In the afternoon, we will visit the City of Cusco on a guided tour visiting the Main Square, the Cathedral and the Temple of the Sun or Korikancha . Then, we go out of the City to visit the Inca sites of Kenko, Tambomachay, Puca Pucara and the impressive Fortress of Sacsayhuaman, strategically built on a hill overlooking Cusco, famous for its enormous carved stones, some of them standing over 9 m / 30 ft high and weighing over 350 tons. Day 09: Cusco – Sacred Valley of the Incas. Early morning excursion to the Urubamba Valley, the Sacred Valley of the Incas, to visit to the picturesque Indian Pisac Market the shopping paradise of the andes where barter is still practiced, after to enjoy the unique atmosphere during a typical lunch. In the afternoon, we visit the Inca Fortress and Citadel of Ollantaytambo, built to guard the entrance to this part of the Valley, and protect it from possible invasion from the tribes in the Lower jungle. You can walk through the quaint streets of the nearby Town, and get a good idea of what this Strategic Military, Religious, and Agricultural Centre was like during the era of the Inca Empire, in the afternoon return to your selected hotel for overnight. Day 10: Cusco –Aguas Calientes. After your breakfast you will have the morning free and the opportunity to visit or walk around the main plaza, we will recommend you a couple of restaurants to have lunch. In the afternoon we will transfer you to Ollantaytambo train station for an hour and a half journey to Aguas Calientes town which is located down of the inca citadel of Machu Picchu, overnight at your hotel. Day 11: Machu Picchu – Cusco. Excellent opportunity to wake up early and enjoy a beautiful sunrise in the Inca Citadel of Machu Picchu as well, You will make the 25 minutes by bus ascent to the “Lost City of the Incas”, known as Machu Picchu. We will have a guided tour into the ruins for around 3 hours; our guide explains the astounding degree of technology achieved by the builders of this famous site. The tight construction, the water channels, the staircases carved from the living rock of the mountain, and the Intihuatana, which served as an astronomical calendar, all show technological advancement far beyond anything this area of the world was thought to have achieved. These, along with the Temple of the Sun, the Royal Tomb, the Priests’ House, the Inca Baths and the Temple of the Three Windows, all allow us to glimpse back into the past and, with the help of our guide, revisit the lives of these truly remarkable people. We will enjoy a lunch at a local restaurant in Aguas Calientes in the afternoon train takes you back to Ollantaytambo as well. Meet by our staff and transfer to Cusco and your hotel. Day 12: Cusco – Puno. Early in the morning we will departure by bus to the City of Puno, (3860 m.a.s.l.). During the trip, we pass by the lovely Wacarpay Lake; we proceed to the beautiful Town of Andahuaylillas, and visit the Church of San Pedro de Andahuaylillas, better known as the Sistine Chapel of the Americas, we stop in Raqchi, where we can see a spectacular Inca Sanctuary built by the Inca Pachacutec, and dedicated to the great Inca God of Wiracocha. It has a great central wall with a stone base of fine Inca architecture. Other walls are made of giant adobe bricks. The structure also has two circular lateral columns. Around the Temple are several buildings once used for housing and storage, after an hour and a half we get the pass which is call La Raya where we can see herds of vicuñas and llamas. Then we travel along the High Plateau of Collao, stopping at the Town of Ayaviri, an important livestock and textile Centre, to visit the impressive Temple of Kalasaya, ruins from the ancient Pucara Culture, lunch in a countryside restaurant, where we can enjoy the delightful culinary art of the region. In the afternoon arrival to Puno and transfer to your hotel. Evening free. Note: This regular bus journey is available on private transportation upon request. Day 13: Puno – Titicaca Lake – Uros Island and Taquile. Upon arrival at the Town of Taquile we will have a lunch. Then we will walk through the various hills and archaeological sites of this 6 km long Island. In the afternoon, return to Puno for overnight at your hotel. Evening free. Day 14: Puno – Sillustani on route – Lima. Early morning transfer to Juliaca Airport to board your flight to Lima. On the way to the Airport, we will visit the famous Chullpas of Sillustani, upon arrival in Lima, meet and transfer to your selected hotel. At the appropriate time, transfer to the airport to board your International flight. Copyright © 2019 Marvels Peru Tours. All rights reserved.